It’s all about the dogs…. This week has been all about dogs for me…..which isn’t that different from most weeks, but a little more obvious than usual! 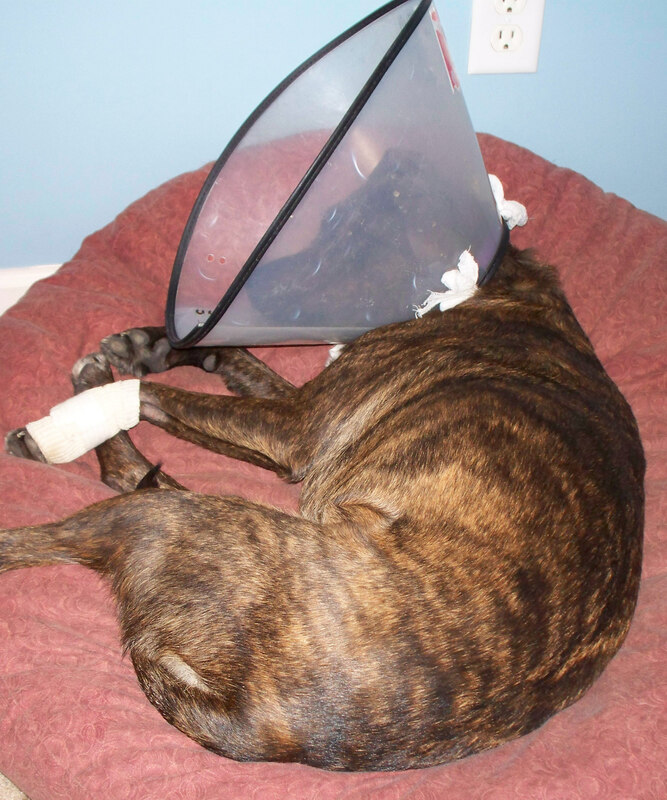 Megan had an injury that resulted in a couple visits to the vet and an awkward e-collar. Then there was a very successful fundraiser for CARA on Friday night! So, it was a week of ups and downs, but definitely all about the dogs! First, about Megan…..On Saturday, during the snow storm, she was outside playing and when she came in, she was licking and chewing at her leg. When I looked, I noticed that she had pulled her dewclaw out and had a bulge of raw meat protruding out of her leg! It wasn’t bleeding and she didn’t appear to be in major pain, which was good, because I wouldn’t be able to get out to take her somewhere! I had one pain pill left from a previous injury, so I gave it to her to help ease any discomfort she was in. On Monday, I took a personal day to take her to see Dr. Cindy at All Animals. They kept her for the day and removed what was left of her dewclaw and I went back to pick her up after the surgery. She came home groggy with her leg bandaged and an e-collar on. When she walked into the house, Amy sniffed her all over and walked away, but Katie reached into the e-collar and gently kissed her all over her face – while Megan stood there weaving and trying to not fall down! Daily antibiotics and a Weds appointment to change her bandage are treating her injury — but the e-collar is the real story here! I’ve always said that Megan is one of the smartest and most cunning dogs I’ve ever known…..well, she proved it again this week. The first night was a comedy in action – she was groggy and unsteady, anyway, and the bumping into everything she came close to made it hysterical to watch! It reminded me of those toys that change direction when they bump into an obsticle – she would stagger to the right and bump into the wall, then stagger to the left and bump into a chair, then stagger to the right and bump into something else…..all through the house! I know it isn’t nice, but I couldn’t stop laughing at her! But that didn’t last long – by the next morning, she had figured out how to live with it! She learned what she could push her way through and what she had to go around….she learned that if she didn’t fit going straight on, she could turn to get one side through and get through that way…..she learned how to get at her food and water without making a mess…..she learned how to use her feet and stationary things around her to get her ball to stop rolling away when she tried to pick it up…..and she learned that she could gently drop her ball in the e-collar and carry it around with her when she wasn’t squeaking it!!! She’s one smart cookie who adapts to whatever the world dishes out!! Friday night was “First Friday” at Cafe 121, benefiting CARA – Carolina Animal Rescue and Adoption. Chef Hamm does this every month to benefit a different local non-profit organization each month. The organization takes care of the advertising, getting the word out, and is there the night of the event to greet people and talk about their organization. Chef Hamm gives the organization 50% of the total sales for the evening!!! WOW – how generous is that? When Friday came, it rained heavily all day long – horrible weather! We were so concerned that the weather would keep people from coming out — quite the contrary!!! Not long after opening at 5:00, the people started coming in…..and they kept coming…..we packed the house and it stayed packed all evening long with lines waiting for tables at several points!!!! The result? About double what I was guessing we would see from the event! And a lot of people had a fantastic meal and enjoyed some great company and conversations! I had a blast – that CARA ended up benefiting from the contribution was icing on the cake! And the winners were the homeless dogs and cats that CARA works so hard to take care of and find loving forever homes for! Kudos and many thanks to Chef Gregg Hamm for all he does for our community!!! Now on to work on the next CARA fundraiser — the 3rd Annual Bella Dinner at Bella Bistro on February 22nd. Chef Chad at Bella will prepare a 5 course gourmet dinner with wine pairings for each course and a champagne reception! Mmmmm! Tickets are $75 each and sponsorship opportunities are available. It will be a night to remember, for sure! Ouch! I had a dog who lost his dewclaw a few years back, and It just looked so painful. I wonder if because that injury is so common, if some kind of evolutionary influence prevents dogs from feeling pain (or excruciating pain) from the injury..?